Forty-five years ago, on Oct. 16. 1968, U.S. sprinters Tommie Smith and John Carlos stood atop the medal podium at the Olympic Games in Mexico City, bowed their heads and raised black-gloved fists during the playing of the American national anthem. Millions of their countrymen were outraged. As in bug-eyed, frothing-at-the-mouth, sending-death-threats outraged. But many, many more people everywhere absolutely thrilled to the sight of two men standing before the entire world, unafraid, expressing their disillusionment with a nation that so often falls so short of its promise. On the anniversary of that salute, and in tribute to Smith, Carlos and every other athlete — Muhammad Ali, Eric Liddell, Curt Flood, Sandy Koufax and on and on — who has acted on principle in a highly public way, let's take a second and really look at John Dominis's indelible portrait of that moment. Could it happen again today? Are there are any athletes out there willing to make a stand that public, and that controversial, knowing that all they're going to get in return is grief? 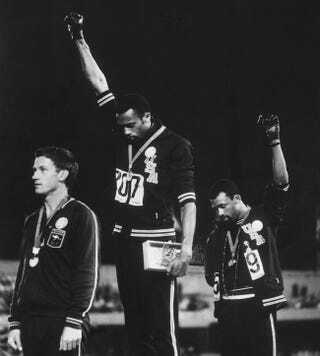 Finally, it's worth noting that the Australian silver medalist in the 200 meters in 1968, Peter Norman, stood solidly with Smith and Carlos, both literally and figuratively — displaying his solidarity with their action by wearing an Olympic Project for Human Rights badge during the medal ceremony. Four decades later, in 2006, both Smith and Carlos were pallbearers at Norman's funeral.